We’d love your help. Let us know what’s wrong with this preview of Landmarks by Robert Macfarlane. Landmarks is Robert Macfarlane's joyous meditation on words, landscape and the relationship between the two. Words are grained into our landscapes, and landscapes are grained into our words. Landmarks is about the power of language to shape our sense of place. It is a field guide to the literature of nature, and a glossary containing thousands of remarkable words used in England, Scotland, Ireland and Wales to describe land, nature and weather. Travelling from Cumbria to the Cairngorms, and exploring the landscapes of Roger Deakin, J. A. Baker, Nan Shepherd and others, Robert Macfarlane shows that language, well used, is a keen way of knowing landscape, and a vital means of coming to love it. To ask other readers questions about Landmarks, please sign up. how this book's language is, simple or complicated?? how is book's language?? comapre to charles dickens? simple or complicated? I rarely purchase books. I don't have the budget or the space; I'm not a collector of things. But every rare once in a while I come across a book so lovely and profound, one that speaks directly to the writer and poet in me, I know it is one I must have one my shelves. Landmarks is just such a book. A collection of essays and reflections on place as well as a series of glossaries of geography, geology, topography, weather and all other possible aspects of the natural world, Landmarks is a gorgeo I rarely purchase books. I don't have the budget or the space; I'm not a collector of things. But every rare once in a while I come across a book so lovely and profound, one that speaks directly to the writer and poet in me, I know it is one I must have one my shelves. Landmarks is just such a book. A collection of essays and reflections on place as well as a series of glossaries of geography, geology, topography, weather and all other possible aspects of the natural world, Landmarks is a gorgeous reminder of what it means to breathe and exist completely in the world, the ineffability of the seasons, the immensity of nature, the healing and generous gift of open space. A wonderful if idiosyncratic book on the language of landscape and nature. Part of the book is a glossary of dialect, regional, slang, jargon and new coinages, organised by subject. These glossaries are lists of words and places where they are in use - linguists may note that the sources are rather selective. The glossary sections are interspersed with essays that explain how this information was collected, and explore the worlds of some of Macfarlane's favourite nature writers - there is also a A wonderful if idiosyncratic book on the language of landscape and nature. The glossary sections are interspersed with essays that explain how this information was collected, and explore the worlds of some of Macfarlane's favourite nature writers - there is also a fascinating section on young children, their childish language and their experiences of nature. Some of this material (notably the chapters on Nan Shepherd and Roger Deakin) will seem familiar to those who have read Macfarlane's previous books. Wow. Amazing. What a lovely book, and one I will return to again and again. I must buy a dead tree copy to keep with my other reference books, for the numerous lists of terms relating to the landscape. And how beautiful that it concluded with children's experience of the land. Magical throughout. This is a difficult book to clearly categorise. It is a book about the natural world, about language to describe that natural world, but is also about the writers and in some cases friends, that he has learnt so much from in his journeys around the UK, up mountains and on long walks. As he writes about those authors, Nan Shepherd, Roger Deakin, Richard Mabey and Richard Skelton, seminal writers that have provided so much influence, through their work and books, it comes across that this is as muc This is a difficult book to clearly categorise. It is a book about the natural world, about language to describe that natural world, but is also about the writers and in some cases friends, that he has learnt so much from in his journeys around the UK, up mountains and on long walks. As he writes about those authors, Nan Shepherd, Roger Deakin, Richard Mabey and Richard Skelton, seminal writers that have provided so much influence, through their work and books, it comes across that this is as much about his formative years and the sense of wonder that nature has given him. Woven into their eulogies, are accounts of journeys taken to favourite places, icy cold lochs swum in, and natural and literary discoveries. But it is also a call to arms. Part of this was prompted by the Oxford Junior Dictionary dropping certain words like acorn, mistletoe and kingfisher. These were removed as children no longer hear or feel or see these things; the replacements MP3, Blackberry and tablet, and objects that are used inside and alone. MacFarlane wants them to bring these words back in to normal use, by getting children to discover them for themselves, and use them in their own ways as they explore the landscape and their imaginations equally. But more importantly, this is a reference, not complete, of local words to describe what people have been seeing around themselves for hundreds of years. There are words for places, water, weather, woods, rocks and animals. Drawn from all parts of the UK, Ireland and Jersey, some of these are familiar and others are brand new to me. They range from the brutally blunt, like 'turdstall' which means a substantial cowpat to 'huffling' which means sudden gust of wind. These lists punctuate the book, giving breathing spaces between the chapters, so you are not faced with the enormity of a huge list. MacFarlane is one of my favourite writers, his poetic prose and keen observation skills mean that the mundane can become the interesting, and the beautiful the breathtaking. It is different to his other books, but it is equally significant. If you have a moment, take some time to read this and immerse yourself in the evocative language he has sown you on the other side of the hedge. This new classic of nature writing zeroes in on the language we use to talk about our environment, both individual words – which Macfarlane celebrates in nine mini-glossaries alternating with the prose chapters – and the narratives we build around places, via discussions of the work of nature writers he admires, including John Muir, Barry Lopez, Nan Shepherd, J.A. Baker, and Roger Deakin (a personal friend for whom he served as literary executor). The book is divided into rough geological categor This new classic of nature writing zeroes in on the language we use to talk about our environment, both individual words – which Macfarlane celebrates in nine mini-glossaries alternating with the prose chapters – and the narratives we build around places, via discussions of the work of nature writers he admires, including John Muir, Barry Lopez, Nan Shepherd, J.A. Baker, and Roger Deakin (a personal friend for whom he served as literary executor). The book is divided into rough geological categories: mountains, woodlands, coasts, and so on. For each landscape, he chooses a patron saint whose written works have influenced how he relates to it. To start with I was unsure the glossary sections belonged, but I came around to them. They are like rests in a piece of music. Whether poetic (“heavengravel,” Gerard Manley Hopkins’s term for hailstones), local and folksy (“wonty-tump,” a Herefordshire word for a molehill), or onomatopoeic (on Exmoor, “zwer” is the sound of partridges taking off), these vocabulary words are a treasure trove. This book consists of chapters that focus on authors of nature writing. Both the authors’ books and their lives are reviewed. Interspersed between these chapters are glossary list of terms used to describe nature, land, water and weather. These words are Gaelic, Scottish, Welsh, Irish, Breton, English and Old English. The meaning and origin of each word is given. The words in the glossary lists are only loosely related to the subject of the previous chapter. I have purchased both the beautiful h This book consists of chapters that focus on authors of nature writing. Both the authors’ books and their lives are reviewed. Interspersed between these chapters are glossary list of terms used to describe nature, land, water and weather. These words are Gaelic, Scottish, Welsh, Irish, Breton, English and Old English. The meaning and origin of each word is given. The words in the glossary lists are only loosely related to the subject of the previous chapter. I have purchased both the beautiful hardcover and the audiobook. I will not remember all the words in the glossary lists. By having the hardcover I will be able to return to the lists for future reference. Having the audiobook allows the reader to hear the correct pronunciation of the glossary words, many of which are Gaelic and thus difficult to accurately pronounce. It took me quite a while to figure out how the text chapters were related to the glossary lists. The organization is unclear! The lists are grouped by terrain type. The words in the lists are in fact not mentioned in the preceding chapter. The glossary lists are read in the audiobook. While the words themselves are marvelous, it is difficult to listen to / read word after word. The words in the lists are not in alphabetical order. Searching for a particular word is difficult. Macfarlane is a poet and has a poet's sensibility. The books and authors referred to tie in with the central thesis that language and nature are intertwined, to appreciate one you need the other. Words are being lost. In loosing these words, we lessen our perception of and appreciation of nature. The book helps to remedy this loss of words. I have appreciated this book both for its central thesis, for the reference glossary lists (containing about 2000 words) and as a valuable source of other books on nature writing. There is an index, source notes and a bibliography. The cover is gorgeous. The audiobook narration by Roy McMillan was good, although sometimes I could not clearly hear the glossary words. The prononciation and intonation is British, not American! I can't go beyond Macfarlane's own words to say what his most recent book is about: 'the power of language - strong style, single words - to shape our sense of place. It is a field guide to literature I love, and it is a word-hoard of the astonishing lexis for landscape that exists in the compression of islands, rivers, strands, fells, lochs, cities, tons, carries, hedgerows, fields and edge lands uneasily known as the British Isles'. Each chapter revolves around one world and one or two writers I can't go beyond Macfarlane's own words to say what his most recent book is about: 'the power of language - strong style, single words - to shape our sense of place. It is a field guide to literature I love, and it is a word-hoard of the astonishing lexis for landscape that exists in the compression of islands, rivers, strands, fells, lochs, cities, tons, carries, hedgerows, fields and edge lands uneasily known as the British Isles'. Each chapter revolves around one world and one or two writers. Each is followed by a Glossary of connected words, arranged into subcategories and indexed by a creative and thorough indexer. I love his use of the term 'word hoard', for words of and from the land are the treasure he seeks himself and which have been shared with him by other passionate observers and listeners. Throughout the book we hear the importance of understanding the local; 'the idea that we learn by scrutiny of the close-at-hand'; that rich perception comes from close observation. The glossaries themselves reflect this close observation of local environments and how they affect life. Any page opening in any glossary will produce something like amod (Gaelic) a free plain almost encircled by the bend of a river, or wetchered (Lincolnshire) wet through after being caught out in the rain. I particularly like some of the words for Ways of Walking - hippit (Scots) stiff in the hips, and slump (Essex) to walk heavily, noisily. You can almost hear the boots clumping. Macfarlane writes superbly: the cover blurb quotes John Banville as saying 'He has a poet's eye and a prose style that would make many a novelist burn with envy'. Again, I don't think I can better this. Acorn, adder, ash, beech, bluebell, buttercup, catkin, conker, cowslip, cygnet, dandelion, fern, hazel, heather, heron, ivy, kingfisher, lark, mistletoe, nectar, newt, otter, pasture, and willow. The Oxford Junior Dictionary in 2008 dropped these words as no longer relevant to a modern-day childhood. Macfarlane would make us all familiar with those words and many more that describe the natural world. His book is a kind of annotated glossary and is beautifully written. I wanted to like this book a lot more than I did. I have thoroughly enjoyed Robert MacFarlane's other works and this book combines two subject - language and nature - which I love reading about. But it struck me as a series of book reviews, each followed by a list of words. The chapters were well written, passionate and beautiful, as you would expect from MacFarlane. The lists however were tedious to read through, with no notes on pronunciation to help with the Gaelic or Welsh words and no clue a I wanted to like this book a lot more than I did. I have thoroughly enjoyed Robert MacFarlane's other works and this book combines two subject - language and nature - which I love reading about. For UK-based people who are interested in nature and wildlife, I think this is an important book. If English is not your native tongue or if you are not interested in the natural world, it is likely that you will not find this book so engaging or significant. The main theme of the book is probably best described in this quote: "It is not, on the whole, that natural phenomena and entities themselves are disappearing; rather that there are fewer people able to name them, and that once they go unnam For UK-based people who are interested in nature and wildlife, I think this is an important book. If English is not your native tongue or if you are not interested in the natural world, it is likely that you will not find this book so engaging or significant. The main theme of the book is probably best described in this quote: "It is not, on the whole, that natural phenomena and entities themselves are disappearing; rather that there are fewer people able to name them, and that once they go unnamed they go to some degree unseen. Language deficit leads to attention deficit. As we further deplete our ability to name, describe and figure particular aspects of our places, our competence for understanding and imagining possible relationships with non-human nature is correspondingly depleted. It is a plea for us to not forget the words in our language that describe the natural world around us and its central idea is that, if we do forget these words, then our link with that world is weakened and that is a bad thing. As it happens, I am a keen fan of the British landscape and its wildlife, so I am sympathetic to the author's point of view, which is why I regard the book as important and is probably the main reason I have rated it highly. It is also very readable which helps. That said, I did skim read some parts of the book. Each chapter covers a particular aspect of the landscape and ends with a glossary of neglected English words related to that aspect. Although I would say that these glossaries are a very important part of the book (they document words that are being lost), they are not the most scintillating reading. I skimmed them and picked out the words that my eyes landed on and that's the kind of thing I might do several more times. This is not the book about language and landscape I was hoping for. I wanted something that evoked Holdstock. I got a series of university lectures, a reading list and a disappointing but pretty word hoard. This book contains none of the layers, history, groundedness or dense sense of place I anticipated. It is oddly secondhand and distant. In the sections where MacFarlane writes about other nature writers there feels like little new. In several chapters he revisits authors he has previously writt This is not the book about language and landscape I was hoping for. In the sections where MacFarlane writes about other nature writers there feels like little new. In several chapters he revisits authors he has previously written about. In others he provides quotes and analysis of other authors he admires (hence the feeling of a university lecture). The personal experiences and sense of adventure that so enlivened his other books are almost absent, or reduced to walking into a cave, visiting an archive and other small vignettes. The chapter on children and landscape is lovely but over the top, and is too short. The words are gorgeous but there is not enough and they are thinly adorned. Dialect is padded out by common scientific or mountaineering terms and the whole is very widely spaced on the page. I was hoping for more terms, more analysis of them, more etymology, more explorations made, parallels drawn. This is a series of essays that combine nature, geography, weather, and the power of specificity with words. To that end, Macfarlane includes lists of words, most from various UK dialects, for land, weather and natural process. Most of the words are in danger of disappearing as man's connection with nature diminishes. As we continue to remove ourselves from nature, we begin to see/think in broad, bland strokes and lose both our perception of and the ability to talk about the natural world's intr This is a series of essays that combine nature, geography, weather, and the power of specificity with words. To that end, Macfarlane includes lists of words, most from various UK dialects, for land, weather and natural process. Most of the words are in danger of disappearing as man's connection with nature diminishes. As we continue to remove ourselves from nature, we begin to see/think in broad, bland strokes and lose both our perception of and the ability to talk about the natural world's intricate and nuanced features. Macfarlane builds his essays around his favorite works of other writers and word-hoarders, so this book is about the landscape of words and thought as much as about actual landscapes. Why did I read it? When first published, several people recommended this book to me, and it was recommended more than once by some. I imagine those recommendations came because of my like of the natural world, and of language. I have no idea why, but I put it on my 'wish list' and then my 'to be read pile' but never actually started it; these decisions I now regret. What's it about? With the Oxford Children's Dictionary removing words relating to nature, e.g. acorn, in favour of technological ter Why did I read it? When first published, several people recommended this book to me, and it was recommended more than once by some. I imagine those recommendations came because of my like of the natural world, and of language. I have no idea why, but I put it on my 'wish list' and then my 'to be read pile' but never actually started it; these decisions I now regret. What's it about? With the Oxford Children's Dictionary removing words relating to nature, e.g. acorn, in favour of technological terms, Robert Macfarlane explores the United Kingdom in search of those words to describe, and connect us to the natural world. Connection. That is the key to this book. In a time, and place which seems to breed disconnection, this book seeks to reunite us with a deep love for landscape, and language. What did I like? Every single word, and most especially the glossaries. Rich in words and landscape, there is so much to enjoy, and explore in this book. I listened to the audio book, which is rather nicely done. I did query a few of the Gaelic pronunciations - being a learner of the language, not a native speaker, I may not completely comprehend the dialectal nuances. I am very pleased I opted to purchase the Kindle edition, too, so I can explore those glossaries at my leisure. Oh, the joy I found in this book: learning new words for phenomenon I had no idea might even exist; remembering 'childish' the way children use language to describe their surroundings; and discovering new Gaelic words I wanted to include in my (ever-expanding) vocabulary. The narrator, Roy McMillan, did a splendid job. I'm afraid I have no idea of the name of other gentleman whose voice was used to read out various words, but his voice gave luscious contrast to Mr McMillan's smooth tones. What didn't I like? I could find no fault with this book. I find fault with myself for not reading it sooner. Just for the record, I've just finished my third read now, following my love for Lost Words, and struck by the humour and word-play as much as anything. It is a rare writer who can tell his audience that the kestrel is also known as a "wind-f*cker" and still invite awe for how language can be specific about different types of hill or waterway. 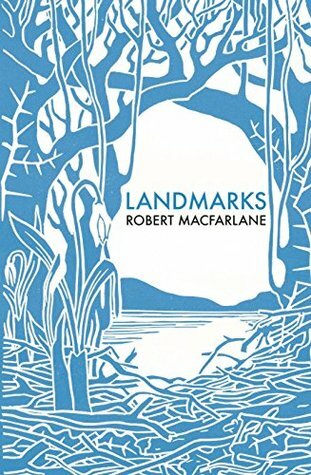 Landmarks by Robert Macfarlane is a special book because it so beautifully and compellingly challenges us to confront our withered relations with nature, our inability to name the landforms, trees, birds, geology, and weather in which we are embedded, our loss of wonder. Using spectacular famous and not so famous nature writers as examples, in combination with his own experiences and perceptions, Macfarlane probes one of Max Weber's key concepts (borrowed from Friedrich Schiller but greatly elabo Landmarks by Robert Macfarlane is a special book because it so beautifully and compellingly challenges us to confront our withered relations with nature, our inability to name the landforms, trees, birds, geology, and weather in which we are embedded, our loss of wonder. Using spectacular famous and not so famous nature writers as examples, in combination with his own experiences and perceptions, Macfarlane probes one of Max Weber's key concepts (borrowed from Friedrich Schiller but greatly elaborated): disenchantment, literally the loss of connection with the natural world's magic, its ability to bewitch us, to put a spell upon us, to help us glide past the fiction of technological mastery so that we don't fall prey (as we already have, I fear) to the arrogance of environmental abuse, careless extinction of life forms as well as landforms, in service to obsessive greed and the utilitarian fantasy that we humans exist to exploit and bend nature to our will. Macfarlane focuses on the British isles and has an encyclopedic knowledge of the great naturalists who have preceded him there. Through him we read of their passions for remote mountains, falcons, the borderlands between urban development and suburban sprawl, vast bogs and the battering tumult of rain-drenched life on the western coasts of the U.K. In between chapters, Macfarlane includes glossaries of words in local use, largely forgotten or in danger of being forgotten, to describe things like the little passageways small animals make in hedgerows to come and go and the various terms used for ice coating plants in post-storm wonderlands. He notes that the Oxford University Press, in its periodic updates of the Oxford English Dictionary, is consistently including new terms like #hashtag and discarding older ones for phenomena like milk fog that no one notices or mentions much anymore. I was reminded of the fact that some Inuit communities have more than a dozen terms for different kinds of snow. If Macfarlane had focused on the Inuits, those would be the terms in one of his glossaries. Macfarlane intersperses essays on different kinds of landscape and the authors who loved them with glossaries that play various nuances on light, kinds of stone, textures of land. Lots of doors into wider worlds and a deeper sense of wonder. A brilliant book. Whilst non-fiction prose, it is really a poem to the land, and to words and ways of seeing, lost and almost lost, that linger around the edges of our landscapes. Magnificent, vision-changing. Review to come! As a lifetime walker and nature lover I learned so much from this marvel of a book. A treasure to keep and refer too often. 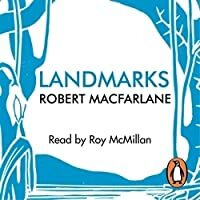 Landmarks is a book I probably thought about more before I read it than during, or after. It's a passionate defense of nature as well as the importance of reflecting nature in language. And who should be more impressed by such a book than someone who longs for nature but feels completely torn from it, someone who grew up in the modern city, in a country (the Netherlands) that has utterly domesticated its landscapes and wildlife – far more so than Britain has. Last summer I went on a cycling trip Landmarks is a book I probably thought about more before I read it than during, or after. It's a passionate defense of nature as well as the importance of reflecting nature in language. And who should be more impressed by such a book than someone who longs for nature but feels completely torn from it, someone who grew up in the modern city, in a country (the Netherlands) that has utterly domesticated its landscapes and wildlife – far more so than Britain has. Last summer I went on a cycling trip to Wales. I wanted to get out into the mountains, into a place I knew little about. All the time I was there, I kept thinking to myself: I do not have the vocabulary to express this; I don't even know where to begin. I have trouble enough distinguishes between even the commonest trees, between your garden-variety birds, and between the very types of rock that I would walk across for miles. When I stopped in the towns in between, the sole bookstores there all stocked this particular work, and it felt a little like Macfarlane was following me around, taunting me. I found myself thinking about Landmarks' premise a lot. If Macfarlane was right – and all signs pointed this way – the generation after me would be even less invested in nature, even less at home in it. That, frankly, is a feat that seems hardly possible to me. Sometimes, though, I was willing to engage with Macfarlane. I would argue that perhaps there was also something profound in this not-knowing, an ignorance which led me to see nature as it is, undiluted by the dichotomisation of words. I realised, when I thought of it, that I mostly skimmed through the pastoral descriptions in old novels. This impulse to painstakingly paint a word picture of a scene seemed to me often an unnecessary remnant of a time before we could leisurely send snapshots of a scene to each other on our smartphones. But it's a weak argument, of course. It certainly is for someone who loves literature. The recreation of a landscape in words is not so much recreation as creation. Even if, as I think it sometimes was, the goal of the writer was utter precision, the words would unerringly reify something new, a simulacrum of the real thing, a branching off into parallel universes. There is, for instance, a Tintern Abbey as is, and then there's Wordsworth's Tintern Abbey, with its hedge-rows that are hardly hedge-rows, and “pastoral farms / green to the very door”. Wordsworth's poem is a perfect example, in fact, for he muses that “oft, in lonely rooms, and mid the din / of towns and cities” he has often thought back of the gleaming abbey scene, with feelings of “unremembered pleasure.” That phrase is telling, and perfect: it is not the place but the pleasure which is unremembered. That is to say, both the original feeling and the feeling of reminiscence stem from the same place, but they are different nonetheless. Landmarks opens perfectly, and sets out its main argument in the few pages of the prologue. After that, though, it becomes more like a compendium of Macfarlane's favorite nature writers, a modern canon. Macfarlane sure has a knack for description not just of nature but of the people who choose to roam through it, diminished to that size at which one feels gratefully unimportant, feels the weight of the carpe diem-dictum falling gently away. While reading this I found that fragments of a review kept popping in and out of my consciousness (the part that wasn't engaged in heavy uphill slogging), things like 'why can't I stop giving his books 4 stars? '; 'if he mentions Nan Shepherd again I'll spit'; 'these Gaelic words ought to have a pronunciation guide (or is there one and I've missed it?) because as it is they might as well all be btfsplk'; 'how do the word lists, which are rather cool in themselves, relate to much of what he's said While reading this I found that fragments of a review kept popping in and out of my consciousness (the part that wasn't engaged in heavy uphill slogging), things like 'why can't I stop giving his books 4 stars? '; 'if he mentions Nan Shepherd again I'll spit'; 'these Gaelic words ought to have a pronunciation guide (or is there one and I've missed it?) because as it is they might as well all be btfsplk'; 'how do the word lists, which are rather cool in themselves, relate to much of what he's said in the chapters they connect with? '; 'I love Roger Deakin, too, but I'd far rather be reading Deakin and the only reason I'm reading Macfarlane is because Deakin died ten years ago'; 'the word lists would be better without the mountaineering and scientific terms which have little bearing on the book's trajectory and I don't care how often he's climbed in the Cairngorms'; 'how is it that although he decries the substitution, in the Oxford Junior Dictionary, of words belonging to the technoscape for words belonging to the natural world which modern children can't be expected to know (e.g. dandelion and buttercup and acorn), he says, nevertheless, at the end of the first chapter, that while we've forgotten 10,000 words for our landscape in time we'll create 10,000 more - surely the degradation of the natural environment in the UK and the loss of the rural communities that gave rise to his 'word hoards' make that unlikely (which he must know or he wouldn't be wasting so much virtual ink on the subject)';'no doubt he's a nice fellow but there's too much hero-worship and - oh damn, there's Nan Shepherd again and wasn't J.A. Baker a weird little so-and-so? '; 'some of the books he mentions are unavailable to the average reader and others are available in modern reprints for which he wrote introductions' [this is getting a bit too Zelig for me];'same old same old I'm done'. Robert Macfarlane’s book, Landmarks, is a rare book indeed. At first glance, Landmarks might seem a technical book due to the extensive glossaries of obscure and rarely used words. Perhaps, a book most suited to English-speaking nature writers. The author was spurred to recover rare words used to describe the natural world—a rare quest indeed-- by the systematic elimination of place descriptors in recent editions of the Oxford English Dictionary. To be clear, this book is a treasure trove to nature writers. Landmarks contains eleven separate glossaries noting words unique to uplands, waterlands, underlands, and other subdivisions of the natural world. However, the author’s equally compelling objective is an elegantly crafted argument concerning the power of words to shape our views of people and place. I am a most fortunate man. Among my many blessings, I live in a spectacular mountain valley and have nearly unimpeded access to well-written books. On my best days, I’ve discovered these activities possess a comforting synergy with being a skin expert. The time spent becoming a critical reader and knowledgeable observer of nature requires an intense attention to detail and curiosity concerning subtle differences—the hallmarks of our medical profession. Many, if not most, readers of this column, despite full professional lives containing far more CPT codes than turned pages or mountain vistas, remain lovers of good books and nature. However, even within this elite group of doctor “bookies”, I have discovered a far smaller and often well-hidden sub-group of fellow physicians who can only be labeled: Word-Nerds. Doctor Word-Nerds are an occult sub-species— true amateurs. That is, they pursue words simply out of love. And, mind you, not just any word. In their consulting rooms, these folks will not rest until they have precisely typed their patient’s skin cancer and are also the ones who feel a near sacred calling to pursue the best words. These are well-considered words correctly applied to sentences, providing descriptions with the same dexterous surgical specificity used in the operating room. Often, while rarely admitting to such socially awkward practices, these word-nerds are the same unusual people who look-up words they don’t know, revel in words that sound like what they describe, and have been busted for reading whole dictionary pages simply on the off chance they might learn a new word. These are also, I confess, my people and we are the first audience for Landmarks—but, not the only audience. Macfarlane, a Cambridge don, and well-known English author has written books concerning the relationship between landscape and the human heart. While Landmarks is a more scholarly book, the author treats words and linguistics with an unexpected warmth and personal touch. Macfarlane’s primary concern is the power of this language to influence how we value or denigrate the physical world. One needs only to hear the difference in words used to describe the same landscape by a casual driver passing through Iowa and those of my grandparents who farmed 240 acres for 50 years to realize the words used to describe the identical physical objects can communicate huge differences in an individual’s values and desires. Macfarlane’s scholarship searched worldwide for over ten years collecting words to describe more exactly the natural world. Who knew a slogger was a word poet Gerard Manly Hopkin’s made famous as the,” sucking sound made by waves against a ship’s side” or nab describes “the summit of a hill” in Sussex, or aquabob refers to a Kent icicle. While we moderns have battered, blunted, and narrowed our language scope and specificity—not least due to a fascination with 180 character tweets,—the author discovers and catalogs a language largely ignored by 21st-century English speakers. This is a language containing a vast and subtle vocabulary. For word-nerds--a candy store of semantic delicacies. Of course, the author’s extensive collection of place language can only be of use if the writer or speaker seeks to observe carefully. Macfarlane argues this careful sort of observing must be encrusted by a desire to know “what is there” rather than to simply confirm the observer’s bias. This author is no romantic, but rather sounds like the scientists who suggest a close observation of a problem often produces more questions than answers. In science, as in nature, as we understand more, a humility develops and a new sense of complexity. This is the type of ongoing “conversation” with a problem that generates precise description and understanding rather than stereotypes. Certainly, a larger, more accurate language that forces observers to see nuance would be extremely helpful in our current political climate. But for doctor word-nerds, the author’s eloquent argument for a recommitment to humble observation and more robust and accurate description is a welcome reminder for our specialty. In Landmarks, Robert Macfarlane persuasively argues that we need a more particularizing language. He has given us wonderful tools and wants us to use these new words to defend our natural world. However, I think he could have equally argued this same case for modern medicine. I was looking forward to reading this book, which promised to look at language and landscape, about "the power of language to shape our sense of place". However it failed to evoke any feeling of landscape, and was a series of essays, largely about other writers on the natural world. These were followed by perfunctory and random lists of words from scattered parts of Britain, completely outwith any context or insight. These odd lists contain numerous Gaelic words too, not introduced as a complete I was looking forward to reading this book, which promised to look at language and landscape, about "the power of language to shape our sense of place". However it failed to evoke any feeling of landscape, and was a series of essays, largely about other writers on the natural world. These were followed by perfunctory and random lists of words from scattered parts of Britain, completely outwith any context or insight. These odd lists contain numerous Gaelic words too, not introduced as a completely separate language, rendered dead without pronunciation notes, which sit cheek by jowl with endless neologisms of Gerard Manley Hopkins. What a wonderful book. A rare book. One that I will not put back on my shelf, because I intend to peek into it again and again. This is a single-handed attempt not only to introduce new readers to a whole literature of the natural, but to encourage the reinvigoration of human interaction with nature, especially in language. The best part of this book are the glossaries--short dictionaries of regional words (some baffling, but many more luminescent) that describe nature in ways that "normal" Engl What a wonderful book. A rare book. One that I will not put back on my shelf, because I intend to peek into it again and again. This is a single-handed attempt not only to introduce new readers to a whole literature of the natural, but to encourage the reinvigoration of human interaction with nature, especially in language. The best part of this book are the glossaries--short dictionaries of regional words (some baffling, but many more luminescent) that describe nature in ways that "normal" English certainly cannot. Robert Macfarlane is a British nature writer and literary critic. Educated at Nottingham High School, Pembroke College, Cambridge and Magdalen College, Oxford, he is currently a Fellow of Emmanuel College, Cambridge, and teaches in the Faculty of English at Cambridge.